It’s week ninteen of 52 Weeks for Earth, the 52-week challenge to gradually reduce your impact on the planet. If you read Zero Waste Home for last week’s challenge, you might have begun to realise the importance of ‘having less’ in order to lessen your impact. That’s why this week’s challenge is to try become a minimalist. Minimalism is choosing to live you life with simplicity and intention. It’s not just about having less material possessions, but choosing to focus on the things that give your life meaning, and not get distracted by putting value on all the rest. You’ll find the clarity gained from minimalism can really make your life more fulfilling, even if you don’t have the newest iPhone, or 20 different pairs of shoes. By choosing everything in your life with intention, all of your possessions will have real functional purpose. Before you buy something, first ask yourself if you really ‘need‘ it. And, if it’s something you do really need, try and look for ways to get it without having to buy new. Perhaps you can ask your neighbours, or your facebook friends if they have one you can borrow. Or you might be able to find it second hand. When you buy something choose a functional (or multi-functional) product, made from quality materials, built to last and be repaired. It’s week eighteen of 52 Weeks for Earth, the 52-week challenge to gradually reduce your impact on the planet. I’ll keep this week’s post brief, as the challenge is to do some reading on the subject of reducing you waste; specifically, I encourage you to read the book, Zero Waste Home by Beu Johnson. This model prevents the consumption of things that would be destined for landfill, like plastics. After consuming less, and choosing quality reusable products, the waste you’ll be left with will be either truly recyclable, (like glass), or organic materials you can breakdown in your home compost system, (like wood). I know the idea of zero waste might sound pretty farfetched right now, but we’ve already begun the process through the last 17 weeks. This book can show you how simple it actually can be, for even the busiest people. Zero Waste Home will provide further advice on a lot of the topics we’ve already covered on 52 Weeks for Earth, such as cutting out single-use plastics, reducing food waste, composting, and buying in bulk. It will also help with future week’s challenges, like becoming a minimalist, finding planet-friendly alternatives to products, cutting out other forms of waste, and more. You can definitely say a lot of the 52 Weeks Challenge was inspired by what I’ve learnt from this book. Following the principals of the book, I encourage you to check out Zero Waste Home from your local library, borrow it, buy it second hand, or get the e-book, before buying a copy new. And if you do buy it new, you can lend it to all your friends when you’re not using it. It’s week sixteen of 52 Weeks for Earth, the 52-week challenge to gradually reduce your impact on the planet. We’ve talked about reducing your waste by cutting out specific forms of plastic. This week we’ll cut down more general plastic packaging, and other forms of packaging, by buying pantry items from the bulk aisle using your own container. I should preface this by defining ‘bulk’: when I say bulk, I’m referring to the pay-by-weight self-serve form of buying dry goods and more. I’m not referring to buying Costco-like large quantities of a single item. While buying a large amount might reduce the amount of overall packaging of buying multiple, there’s the bigger risk of buying more than you need, or even want, resulting in unnecessary food waste. Not sure where to buy in bulk? Try the Zero Waste Home bulk store locator. Or search “bulk near me”. Not all parts of the world have equal adoption of bulk selling. If there’s nowhere near you within a reasonable distance, tell your local stores this is something you want, citing your reasons to reduce plastic packaging and other unnecessary waste. Now that you’ve found your store, or multiple, that stock the items you need, it’s time to buy items free of packaging, and plastic bulk bags. Bring some jars (mason jars are great, but you can use what you have, just make sure they’re clean and free of labels (soak labels, scrub off, add drop of oil to remove sticky residue)) or other containers to the store and first have the service desk weigh the empty jar to get the tare. Tare is the weight of the empty container, write it on the container in permanent marker. Once you’ve filled your container with the bulk goods you’ll need to remember the product number for the cashier. I just write mine in a note on my phone, and recite it to the cashier, but you can use a washable marker, such as a grease pencil to write the number directly on the container. During checkout, your cashier should weigh the container, removing the tare weight (so you’re only paying for the weight of the goods) and enter the product number for the cost. Once you get the items home you can transfer them to another container for storage (if needed), clean the container, and return it to your grocery tote, so you’re ready for you next trip to buy waste-free groceries. Food without the packaging will save you time and money, not to mention the reduction of waste. Another benefit of buying in bulk is reduction of food waste, as you choose the exact amount of an item you buy. If a recipe you’re making calls for 100g of an item, you may find in regular packaging the smallest quantity you can buy is actually 500g. If it’s an item you rarely use you might find yourself struggling to use the remaining 80% of the packet while it remains fresh. Buying in bulk you can buy exactly 100g. You might feel a little anxious about the idea of doing something a little out of the ordinary, especially the first time you’re doing it. But don’t fear, remember you’re doing this for the right reasons; to reduce your consumption of unnecessary plastic and other waste. This is the way shopping SHOULD BE. You’re a part of a bigger movement to reduce waste; confirmed by the opening of zero-waste supermarkets across the world. Do it with confidence and no one will question you. And if they do, know that it’s completely legal to use your own container, provided it’s clean. NOTE: This will be the last post written for 52 Weeks for Earth for a while, please follow us on Facebook for the weekly challenges. It’s week fifteen of 52 Weeks for Earth, the 52-week challenge to gradually reduce your impact on the planet. In our ongoing effort to reduce our food-related climate change emissions, this week I’ll show you how to start your own compost. Last week we talked about the important reasons you should keep your food waste out of landfill. If you missed that here’s a roundup: organic matter like food waste that is wrapped in plastic and buried in landfill is forced to decompose without oxygen. This anaerobic condition produces methane, a greenhouse gas 20x more powerful at trapping heat than carbon dioxide. Currently 20% of everything that goes into municipal landfill is food, so this is a huge problem. But it doesn’t have to be. There’s plenty of alternatives to sending food to landfill, as outlined last week. This week I’m going to show you an easy, do-it-yourself, indoor composting method; vermicompost! Vermiculture is a composting system that relies on worms to aid in the decomposition process of food and organic matter. The end result is ‘vermicompost’, a nutrient-rich material that can be used as fertilizer for growing food and plants. Container, or worm bin. There’s a variety of options, homemade wood or plastic boxes, galvanized garbage cans, and commercial vermicomposting bins. Try use what you already have on hand, and avoid buying new plastic if possible. 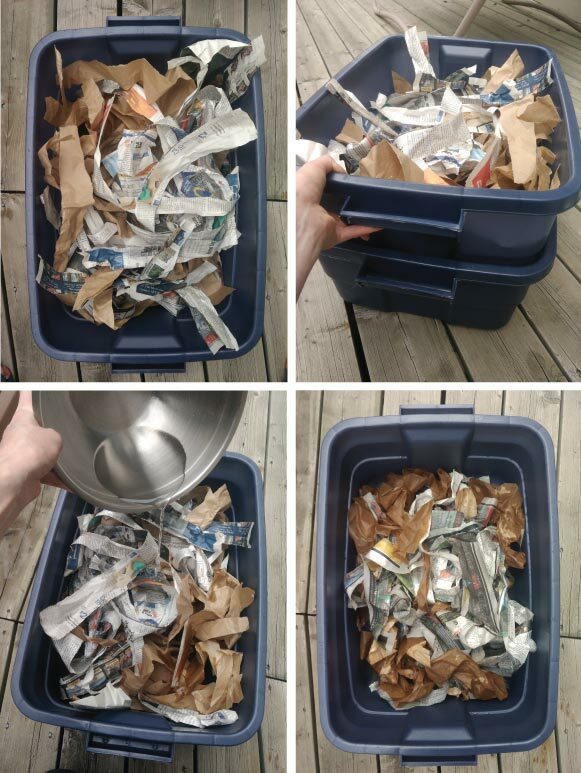 Bedding, such as torn newspaper, shredded corrugated cardboard, brown leaves/straw, egg cartons, non-glossy paper, other chemical-free things able to hold moisture, allow air exchange and host the worms. Water (left out overnight to evaporate any chlorine). Worms, specifically red wigglers, I got mine from a friend who introduced me to vermicomposting. If you don’t know any worm keepers try some local buy & sell or gardening Facebook groups before buying online. A drill, or something to make holes in your container if it is closed. Some mesh optional to cover those holes. I used off-cuts of flyscreen I got from a friend. And your food scraps! Designate a specific airtight container to keep close-at-hand in the kitchen for food waste collection. You will also need a place to put your compost, somewhere out of the direct sun, with a regulated temperature (don’t let them freeze over winter), that will be convenient to visit a couple times a week. Luckily the bin doesn’t take up much room, so you should be able to find a place, even in a small space; it just might not be where people expect to find worms! I keep mine in the laundry because it’s dark and maintains a consistent temperature. Here I’m using two 38L plastic tubs. As they’re plastic I’m first going to rinse them thoroughly. I’m using two containers stacked so that I can drain the liquid produced by the vermicompost (or ‘worm pee’) from the top container into the bottom container. To do so, I’ve drilled a series of holes into the bottom of the container. 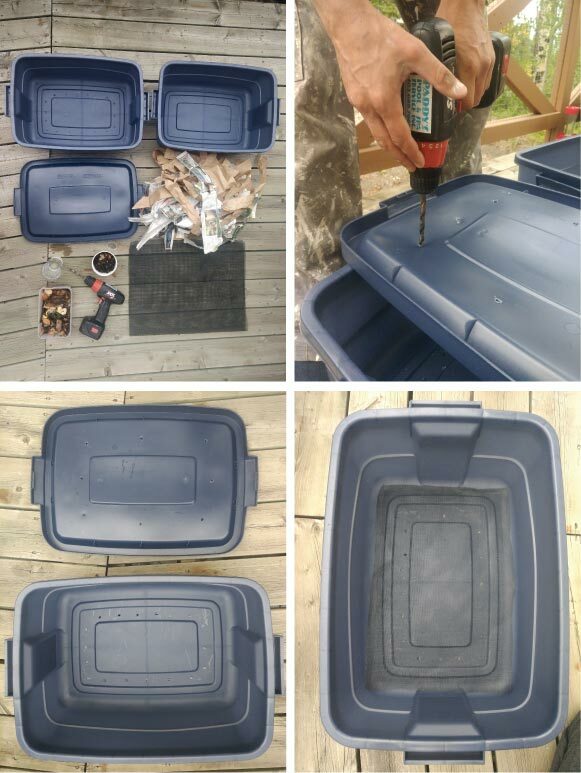 I’m also going to drill some holes into the lid of the container so that the compost can be well ventilated (my drill battery died, I’ll likely add more than seen in the photos). TIP: Don’t worry about the holes letting out odors, if your compost is healthy it will have little to no odor. If it’s smelling, it is likely because air isn’t circulating, or you’ve added too much food. 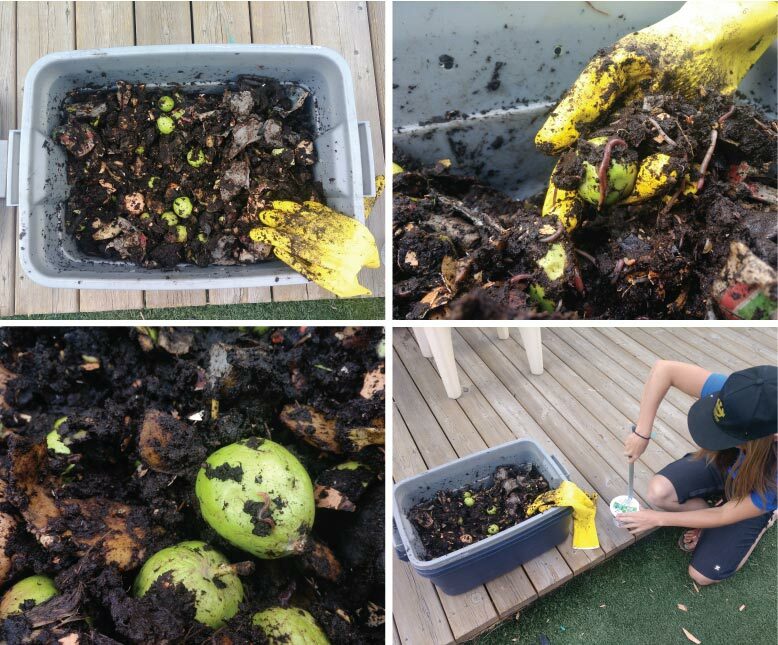 When your compost lacks sufficient air, anaerobic organisms will begin to take over (just like with food in landfill), and will produce a bad odour (like methane!). We’ll use the mesh to cover the bottom holes, so the composting materials don’t fall through. And to cover the holes at the top, to keep any other critters out. Add enough bedding to fill your container, once wet it should shrink to fill your container halfway. If it doesn’t add more. Worms bodies are 75% – 90% water, so your bedding must be a similar dampness for them to breathe. Therefore, you should add roughly 3 times the weight of your bedding in water. Once your bedding is wet enough you can scatter your worms on top of the bedding. Do this under direct lighting so the worms will borough into the bedding. Once they’re gone from sight you can add the lid and let them settle in for a day before adding food. You might want to start with a small amount of food waste to see how they do. Dig a hole and add food waste, before covering in 10-15cm of bedding. Check back in a couple days, and feed again in about a week. You’ll find your vermicompost capacity for food with increase over time if your worms are happy and multiplying. Ensure you mix the contents up often to ensure the compost as adequate aeration. A pair of rubber kitchen gloves will come in handy for handling and mixing! Along the way you might need to add more bedding, if your compost is looking too wet, starting to produce and odor, or if your compost has become less habitable for your worms and you aren’t yet ready to harvest. Worms will eat any food and organic material (cotton, dust, wooden utensils, etc). Avoid adding meat and animal products, as these can cause odors and attract rodents. Don’t add too much citrus at a time, as it can become too acidic for the worms. And never add anything nonbiodegradable, like plastic (watch stickers on your produce), foil, glass, etc. Once you’ve had for vermicompost going for a few months you’ll start to see the level of the contents decreasing despite continuously adding more food. After about four to six months you can plan to harvest your vermicompost. 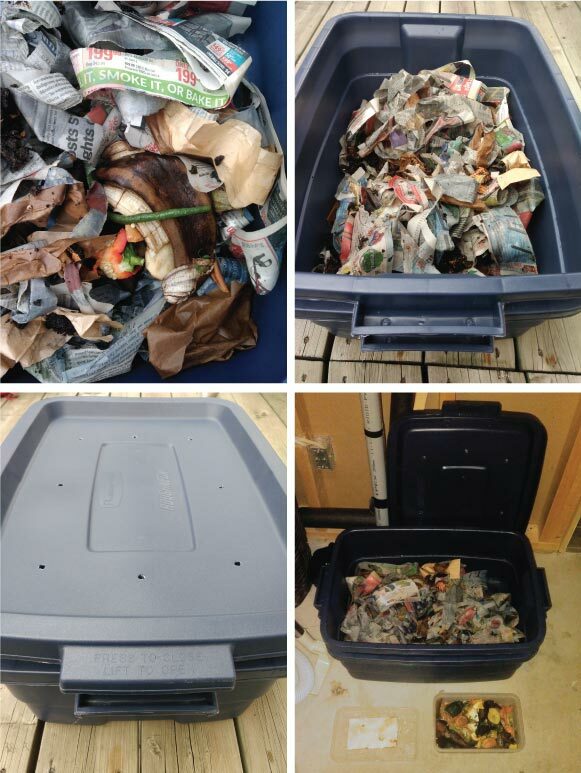 Dump and Sort using a plastic sheet under direct lighting dump the contents of the compost out. Sort into pyramid shaped piles. Wait 10+ minutes for worms to crawl away from the light, remove top layer into another container, repeat. Once left with mostly just worms add to fresh bedding. Side to Side the less hands on method! Feed worms on one side of compost for several weeks. The worms will migrate to the side with a food source, at which point you can collect the casting from the vacant side. Replace with fresh bedding. Repeat on the opposite side. 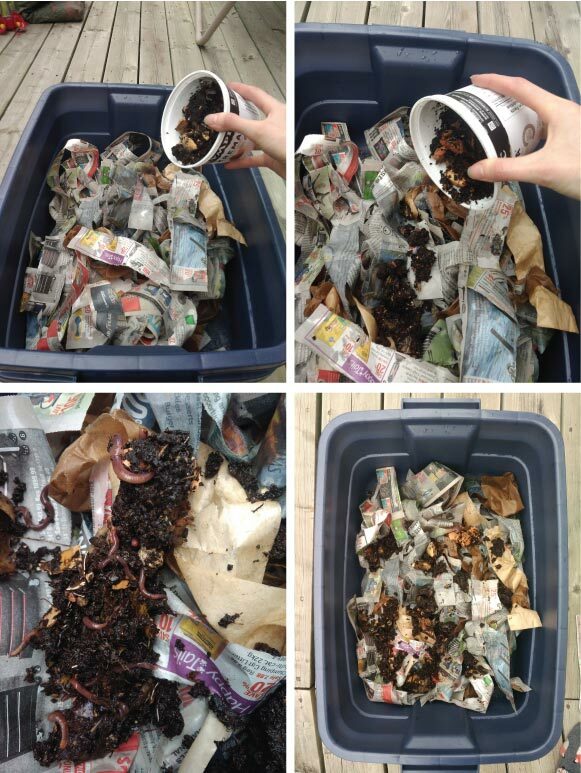 Vermicomposting is a cheap, low-maintenance, compact and even fun way to ‘recycle’ your food waste. Say goodbye to a stinky kitchen bin and regular trips to empty it. Start producing rich fertilizer to grown more food. Feel free to reach out if you have any questions. Thanks to Grace for the worms, and the introduction to vermicomposting. I only hope we can all be as good worm parents are you. Her happy worms are the final photos above. It’s week fourteen of 52 Weeks for Earth, the 52-week challenge to gradually reduce your impact on the planet. We’ve mentioned briefly before the problem with sending food to landfill, and in fact, 20% of everything that goes into municipal landfill is food. Let’s reduce our contribution to this by stopping putting food waste into landfill. The first step of reducing food in landfill is to reduce your overall food waste generated. But even done perfectly, there’s always food wastes associated with the preparation of food; the stalks, cores, husks, peels of food that is uneatable, or unappetising. We might be able to get another life out of vegetable scraps, by planting those that regrow to food or houseplants, or boiling them for stock, but food waste is inevitable. Everything must breakdown eventually. But it’s up to us to decide how the food waste we produce will break down. When sent to landfill, food waste is first wrapped in plastic garbage bags, and sandwiched between more of the same into a large pile, before eventually being covered over entirely. This environment is built to contain all that waste, but isn’t very conducive to the natural breakdown of food. Trapped without air, food decomposing in landfill actually produces methane, a greenhouse gas over 20x as potent as carbon dioxide at trapping heat. In fact, landfills account for 34 percent of all methane emissions in the U.S. In addition to the production of methane, landfill contaminates soil, ground water, and pollutes debris in surrounding area. Overall, landfills are a waste of resources, certainly there’s the cost of transporting and managing landfill and it’s by-products, as well as the land space that’s overtaken to manage our waste. Habitat used for landfill is altered beyond return to its original state, and will affect birds and wildlife in the area who can be attracted by the food, much of it not good them. While today there are far fewer landfills (the US has 2000 active landfills, where previous there was over 10,000), this means that trash is travelling further to be disposed of, generating more greenhouse gas through transportation. Landfill is also just a waste of all the resources it took to produce all those materials in the first place. For example, up to 50% of all landfill space is paper, much of which could have been recycled to make more paper, rather than cutting down more trees for new paper. What you choose to do with your food waste depends what option best suits your lifestyle and diet. The most self-sustaining option is to start your own compost, having it at home is also easier than having to take your waste somewhere for collection, such as town food waste bins. There’s several ways to compost, which suit all sorts of lifestyles and environments, the good news is they’re all relatively easy to maintain once set up! Vermicomposting, or worm compost, is relatively compact, easy to make, and manage, plus has the added benefit of a whole family of new pets; red wiggler worms! Next week I’ll show you how you can easily set up your own vermicompost. If you have the space in your garden you might consider starting a compost heap with an open bin or pile, or a closed bin or a compost tumbler might suit your needs. If you eat meat, fish and daily, there’s even methods of composting that into nutrient rich melon holes, or using a green cone keeps food out of the waste stream, however, doesn’t produces usable finished compost. Today there’s even an electronic and computerised indoor composter called NatureMill. Perhaps you or your neighbours have some chickens who will gladly eat most of your scraps, even meat. Chickens also have the added benefit of producing eggs, who’s shells you can actually crush and feed back to them (it’s not as cannibalistic as it sounds, okay?). Just be sure to find out what they can and cannot eat beforehand. If your local council collections food waste, whether by collection at your property, or at a specific collection bin. How collected food is treated depends on your council but there are several options. Where collected with garden waste, it is treated by in-vessel composting at a local commercial composting facility, the final product being nutrient-rich fertiliser used in agriculture, landscaping and horticulture. Food waste collected alone is often composted with anaerobic digestion, producing compost and biogas used as green electricity. Once you stop sending your food to landfill you’ll see a drastic reduction of the total amount of waste you’re sending to landfill, which means less trips to take the trash out, and you’ll have less stinky garbage cans, as pretty much everything wet is headed elsewhere! In addition to reducing methane emissions you’ll ensure the resources and nutrients that went into making your food isn’t just lost to landfill, but is returned to the food cycle in some way. It’s week thirteen of 52 Weeks for Earth, the 52-week challenge to gradually reduce your impact on the planet. In recent weeks we’ve been changing our food habits to reduce our food-related climate footprint. This week we’ll be continuing this work by considering starting to grow your own food. Recently we’ve spoken about food mileage, and the carbon impact of transporting food around the world, highlighting the importance of eating locally and in-season. Well, what’s more local and in-season than food grown in your own backyard, or balcony, or kitchen windowsill? Growing your own food is a very rewarding practice, and it really reconnects you with the food cycle. Starting with seeds, or even food scraps, you can grow delicious and nutritious organic food for yourself and family or friends. In upcoming weeks I’ll show you how to start your own compost, so that once grown and eaten, you’ll be able to compost any food waste. Once composted, that food becomes rich soil and fertilizer for you to grow more food with, thus completing a circular food chain. What you choose to grow depends on where you live, what season it is, your diet, and what your goals are. There’s many resources out there on how to grow food in different climates, and environments, such as apartments and other small spaces. You can utilize what you have at hand to grow food, upcycling plastic containers, bottles or tin cans into pots keeps them out of the waste stream for longer, and quality ones might even be used over and over again. Leafy greens might be a great place to start, as they’re easy to grow, can be harvested easily at the time of eating, and the store-bought counterpart requires high energy use for refrigerating during transportation. Similarly, growing herbs is easy, and reduces food waste as you only need to harvest what you need for each meal, unlike large bundles of fresh herb bought from the store. One of the simplest things to keep alive and regrow from food scraps is green onions (also known as scallions or spring onions). Pick up a bunch with healthy looking roots at your grocery store, once you get it home simply pop it in a glass of water and place in a sunny window. This will actually keep the plant alive for weeks; just remember to change the water regularly. You can even cut all the green off and eat it, and it will grow back a few times. To keep it growing for longer, simply plant the roots in some soil and water regularly. And just like that you don’t have to buy green onion again! 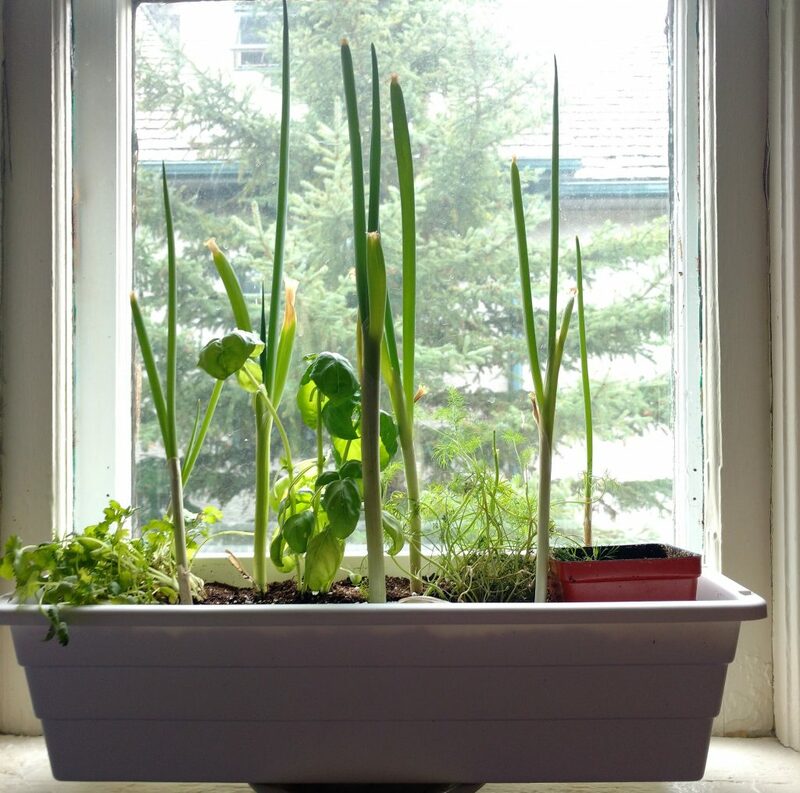 SIMPLE: Cilantro, basil, dill and green onions growing on my windowsill last summer. When you grow your own food, you can opt out of using pesticides, herbicides and synthetic fertilizers, saving the planet the pollution from these chemical-based substances. Most generic nitrogen fertilizers require a great deal of energy to produce and transport, and peat fertilizer is actually harvested unsustainably. Instead, you can produce your own fertilizer through composting (look forward to week 15). Choosing not to use pesticides also helps to protect the diminishing population of bees, essential for growing at least 30% of the world’s crops. Knowing exactly what went into growing your food is a good feeling, one you rarely get from your regular grocery shop. It also saves you money! Instead of buying expensive organic produce, you’ll be growing your own from the comfort of your home. That’s the freshest tasting food you can get. It’s week twelve of 52 Weeks for Earth, the 52-week challenge to gradually reduce your impact on the planet. This week’s challenge comes hand-in-hand with last week’s challenge to buy local. We’ll be keeping our food local by eating in-season produce, or going foraging. Once you’re choosing to only buy local products you’ll fall into the habit of buying what’s in-season naturally, as it’s all that’s available to you fresh. As we learned last week, transportation makes up 11% of your food-related climate footprint, (the biggest contributor being what you choose to eat). This transportation impact is largely due to importing foods that are unable to be grown locally, such as out-of-season products. Unfortunately, along with the many comforts of modern life, we’ve come to expect every kind of food to be available to all year-round. This is truly unnatural though; in cultures that live off the land their food sources change with the season, utilizing what’s available to them. Eating in-season produce is the most authentic way to feed yourself, as it’s the food that suits the season and supports your body’s natural nutritional needs. Hearty root vegetables are warm and filling in the winter, while leafy greens offer fresh and light summer salads. Eating seasonally also ensure you get a wide variety of food in your diet, not just your regular favourites. So what’s in-season in my region? Now you’re keen to buy your produce in-season, you might want to figure out what your options are before heading to the store, perhaps while doing your week’s meal planning. Luckily there’s a lot of great tools online to tell you just that, such as Seasonal Food Guide in the US, or you can find one for your region with a simple Google search like “what’s in-season in ____”. Alternatively, get along to your local farmers market and ask the staff, they’ll know what was harvested yesterday, as they might have been the one to do the harvesting! What better way to find local in-season food than to explore what’s growing wild in your area? For example, right now where I live, I’m able to find wild rhubarb, chives, nasturtiums, spruce tips, and dandelions which have a number of uses for food! Just make sure to do your research before you start eating roadside plants though! Learn what can be foraged in your area, how to identify those plants, and know what potentially poisonous look-alikes to avoid. As we learned last week, buying locally not only reduces your footprint, but supports your local farms, communities and economy. The best way to eat locally is to stick to a seasonal diet, and resist the urge to buy whatever foreign produce is available at your big grocery store chain. Produce grown in-season also requires far less human assistance, such as pesticides and preservatives to grow and be sold, which means it can be more organically grown. It’s week eleven of 52 Weeks for Earth, the 52-week challenge to gradually reduce your impact on the planet. We’ve talked about the carbon impacts of other aspects of food, such as food waste and eating meat. Another big carbon contributor of carbon in our food system is from the transportation of food all over the world. This week we’ll endeavor to buy local products, and local produce. As food travels long distances to reach our plates, the impacts on the planet adds up through the fuels used to transport and refrigerator it along the way. It’s estimated that an average American meal travels roughly 2400 km from farm to plate, and along the way takes 10x the fossil fuel energy than the energy we get from that food. We can avoid this carbon heavy process by being selective about what we buy and from where. Choosing to buy locally, whether that’s from your community at a local farmers market, or produced within your own country when at the grocery store, can reduce this fossil fuel consumption. As well as that, different types of food have different storage and transportation requirements. For example, berries and leafy greens require energy intensive refrigeration during transportation, so save these and other easily-perishable items for your trip to the farmers market. And the same applies to everything we buy and consume. The farmers market can provide more than just food, you might be able to find locally made soaps, cosmetics, crafts, home furnishing and other things you’d normally buy. Depending on your country, there may be a recognizable label for products made in your country, such as Australia’s “Australian made” logo with the kangaroo. Otherwise look a little harder at the products you buy and look for that small text stating “made in..”. If you can’t find this information on a branded product, have a look online with a Google search like “where is ___ made?”, or by visiting the manufacturer’s website ‘about’ page. It’s worth noting just because a company is based somewhere doesn’t mean the product isn’t actually produced on the other side of the planet. Yes, it can take some effort to made an extra trip to the market, or research products to find an alternative that’s locally made, but it’s worth it to reduce what you can of the 11% of your food-related climate footprint currently made up by transportation. If there’s no alternative you can find that made in your country consider whether you really even need to make this purchase before you buy imported. I recognize that unfortunately you can’t buy everything locally made, such as electronics. In this instance, I’d encourage you to still try to buy from a local store rather than the endless options of online stores. It’s week ten of 52 Weeks for Earth, the 52-week challenge to gradually reduce your impact on the planet. Last week we talked about food waste in our society and how it causes greenhouse gas emissions. This week we’re going to look at another aspect of our food system which generates a huge amount of emissions. Let’s try eating less meat, for the planet. You may, or may not have heard that the agriculture industry is the single biggest contributor to greenhouse gas emissions. That’s right, more than the combined total of all transportation; 13% vs 18% from agriculture. And the cause of this is the mass production of animals raised to be eaten. You see, raising animals uses food, water, land and energy, all so that we can then eat those animals. Not only that, but methane is produced by cow’s digestive system, between 70-120 kg of methane per year per animal. As mentioned in last week’s post; methane is more than 20x stronger than carbon dioxide at trapping heat. This means that livestock and their byproducts actually produce more than half of worldwide greenhouse gas emissions. In the west, we eat a lot of meat, on average, American’s consume 122 kgs of meat per person per year. But when you look at the impacts of raising and eating meat it kind of seems crazy we go through this whole arduous process when we can actually just eat the plants we feed the animals instead! So this week’s challenge to eat less meat is a relatively easy one. Simply swap out meat for plant based alternatives in meals 2 – however many times you feel comfortable. Or start going with the trend of #MeatlessMonday at least. If you’re under the impression that you can’t get your recommended protein requirements without meat, never fear! There’s plenty of protein in a variety of plant foods, such as beans, lentils, chickpeas, tofu, soy and much more. Check out this guide to plant-bases sources of proteins on One Green Planet and get inspired by their huge library of yummy recipes. And remember, the recommended dietary allowance of protein is 0.8g per kg of body weight per day, on average 46g for a woman, and 56g for a man, depending on activity level. Chances are you’re eating over that recommended amount on the average meat-eating diet. Due to each animal’s needs and outputs, the carbon contribution of different types of meat differs greatly. So in cutting down on meat, you can also choose to cut down on carbon heavy meats first. For example just 1 kg of beef produces 34kg of CO2 emission, and lamb creates 17kg, whereas pork and chicken are far lower, at 6kg and 4kg CO2e respectively. If you’re still unconvinced, or want to learn more about this issue check out the documentary film Cowspiracy.